I created an inflight battery cover with my CAD and 3D printer. It simply clicks on it and keeps the battery in flight about 5-8 degrees warmer than normal. Its a prototype. with your printer settings you can increase the print quality. Here you can download my stl file. The URL link fails to open for me... is this an active link? I'd like to download your STL file, I don't have a 3D printer but know a few that do and hopeful they'll print up a copy. Is there room between cover and battery to fit a toe warmer? I'm looking at various 3D printers... may I ask what printer you're using? 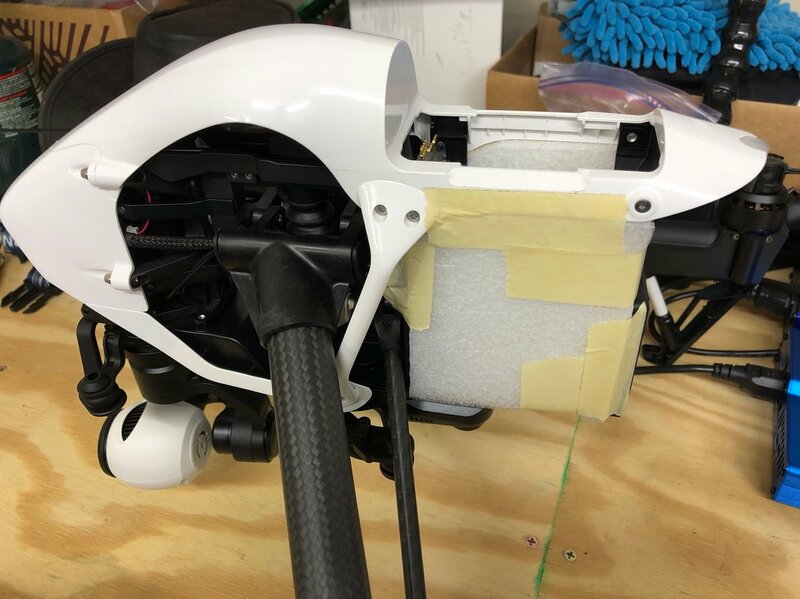 @dougcjohn Cut and paste DJI Inspire Battery Cover by acstrobe into your browser. The link works that way. This worked out great for me today. I flew in 24F temps. Started with a 19.5C battery temp and ended with a 31.5C battery temp. I think it worked out very well. Some simple foam and masking tape. Easy peasy. I used the very same closed cell foam but used clear packing tape instead. Much lighter than the Spaceloft material sample i bought. Well I just used mine today. It is 28 degrees outside. Flew a tb48 with the mod and the two extra batteries with N Watts x5 holder attached. I did not use the toe warmers. When the flight was done the battery showed a temp of 41.2C.. Much Much warmer then if I did not use the battery insulator. I would have to say you would only have to use the toe warmers in the pockets if the temp was in the teens or at 0. I think DJI should have made this an option for those in cold weather, not just a sticker for the battery either. What flighttime do you get With the extra battery?